All extracts from The Cripps Version: a life of Sir Stafford Cripps, by Peter Clarke, published by Allen Lane, The Penguin Press, 2002. These are just brief extracts from a very long book, 574 pages, which is worth reading in its entirety. His death on 21 April 1952 was headline news around the world. For example, all the main papers in Paris broke the news across two or three columns. 'Cripps est mort' . . .
Cripps . . . had been featured on the cover of practically every major North American new magazine - Time. . . Newsweek . . . he had been one of the cornerstones of the post-war Labour Government from 1945 to 1951. Indeed from 1947 he emerged not only as the executive force directing its strategy for economic recovery but also as the public face of 'austerity' - an image that came to characterize a decade. . . . and was seen for a while as the only plausible challenger to the wartime leadership of Churchill.
. . . Cripps's reputation suffered, in death as in life, . . . comparison with that of his great rival . . . Churchill and Cripps provide a nicely stylized study in contrasts. On the right, the leader of the Conservative Party, with strong nationalist and imperialist instincts: a fat man who notoriously enjoyed his cigars, his champagne (and other people's too) and his brandy; and who made it a central aim of his post-war policy to give the British people more red meat. On the left, a socialist prig, . . . and an increasingly overt Christian commitment: a lean, ascetic man who made a point of abstaining from alcohol, who became a vegetarian, and who ultimately gave up his only conventional 'vice', smoking, on doctor's orders. Cripps persisted with congruent remedies. He established a connection, literally ended only by his death, with the clinic founded in Zurich forty years previously by Dr Max Bircher-Benner, whose theory was that many illnesses, including colitis, could be cured by a strict raw-food diet. . . .
Apart from carrying on smoking, Stafford settled into the new health regime and Isobel [his wife] joined him in becoming vegetarian, initially out of solidarity. Diana [daughter b.1913] became the most fervent convert, later publishing a recipe book on salads for Purcell Weaver's Bureau of Cosmotherapy. There was much family discussion about best practice. 'I entirely agree with the necessity for the bran,' wrote Stafford while on an ocean crossing, 'but unfortunately so far as I am concerned it doesn't function at sea so that I am thrown back on the dear old wash-out.' It would, however, be wrong to suppose that Goodfellows was reconstituted as a vegetarian camp or health spa after 1935. [other family family members detailed as continuing, or reverting to, meat-eating]. . . .
[From December 1939, following the outbreak of war, Cripps made a world tour with a younger political colleague, visiting India, Russia and China, returning via the USA. It was clear that India made the biggest impact on him, and he became quite close to Nehru.] Cripps insisted on having his own meals prepared from salads, fruit and vegetables whenever possible, He also showed a strong self-preservation instinct in foraging for himself, as Wilson [Geoffrey Wilson, his younger companion who had lived at Goodfellows] - a less rigorous vegetarian, who had been known to eat ham rolls in Europe and was ready to try the local dishes of Asia - wryly observed on one occasion in Lahore. 'The occasion was somewhat marred for me by the fact that S. had eaten the only two chocolate cakes before I had an opportunity to get going. He later gave the somewhat lame excuse that unless he got what he could while the going was good, he might have to eat some of the Indian food.' In a country where vegetarianism was widely practised, and indigenous food free of meat thus available, Cripps's lack of gastronomic enterprise may have been a joke, but one tinged with fastidious ethnocentricity. . . .
[On leaving India Cripps and Wilson went through Burma to China to meet Chiang Kai-shek] In China Cripps seems to have been more relaxed than in India in his appreciation of the local cuisine, even overcoming his suspicion that some vegetable dishes might have been prepared using animal fats. Chinese hospitality and ingenuity combined to give their guests lavish banquets, in which the outward appearance of chicken, ham, bacon, liver and fish dishes belied their vegetarian substance [a long time before soy-based fake meat was known in the west...]. While Cripps showed himself duly appreciative, it is evident that his distinctive diet excited considerable interest from his hosts. Whether through politeness or conviction, Madame Chiang Kai-shek pressed him for details - 'as they both thought I looked so well on it' - and threatened to impose it on the Generalissimo too. Indeed, later in the year, when Cripps was ambassador in Moscow, the two of them were still exchanging advice on diet.
. . . They finally arrived in Moscow on 15 February . . . [officially still a 'private' visit] Molotov agreed to see Cripps at 5 p.m. on 16 February in the Foreign Minister's magnificent office in the Kremlin. . . . On 25 March Cripps and Wilson left Hong Kong, hopping each day across the islands of the Pacific [this was before Pearl Harbor of course] . . . Cripps spent one night in California . He had arranged to have dinner in Hollywood with Charles Chaplin. . . back in London, via Paris [and Washington, New York and Naples] on 23 April 1940. [In May 1940 Cripps went back to Moscow, this time as British Ambassador, with Churchill now Prime Minister - while the Soviet-Nazi pact was still in place] Cripps's diet was, as always, a concern, especially since fresh vegetables were hard to obtain. But after a few weeks he told Isobel: 'As to myself I am really very fit only in danger of getting too fat as they will insist on feeding me much too well and a raw diet isn't possible though latterly I have been having lots of fruit.' . . . He had finally been granted an interview with Stalin on 1 July in order to present a message from Churchill. . . . [on June 22, 1941, the Nazis broke the pact and invaded the Soviet Union while Cripps was briefly back in London - he had been predicting this since the previous March. Churchill hated communists, regarded Cripps as little more than a fellow traveller and had refused to believe him].
. . . The Moscow talks, starting on 16 December [1941, a week after Pearl Harbor brought the Americans into the war ], constituted the finale to Cripps's diplomatic career. [Anthony Eden, British Foreign Secretary - later Prime Minister in the 1950s - had travelled from London] . . . Cripps was a participant throughout, flanking Eden alongside Cadogan of the Foreign Office, and facing Stalin and Molotov on the Russian side, with Maisky as interpreter. At a personal level the meetings began in an atmosphere of cordiality, even gaiety, sitting late into the night over champagne and caviare with Stalin. We got quite hilarious at the end and I asked him to give a judgment on a very difficult and vexed question for me which was whether caviar was fish or eggs. This amused him greatly and he decided it was eggs. They tried to make me drink the numerous healths [Cripps was teetotal] that they drank and eventually I promised that I would if they signed two agreements but only after the signatures and not before. [February 1942] The mass-circulation Sunday Pictorial, . . devoted a double page spread . . . It can be seen as a milestone in the making of the Cripps myth . . . Naturally, Hern's [Anthony Hern, journalist] article mentioned Cripps's vegetarianism, which was attributed to illness contracted during his time with the Red Cross. 'He usually has one meal a day, consisting of vegetable, sour milk, wholemeal bread and butter, and an occasional baked potato.' [The article went on to make Cripps into a saintly hero, effectively crediting him with bringing the Russians into the war on the British side. . . . opinion polls were showing dissatisfaction with Churchill's running of the war effort, and increasing support for Cripps. Churchill resolved this by making Cripps a member of the seven man War Cabinet].
. . . It had been a piquant moment when the new Lord Privy Seal and his wife went to lunch with the King and Queen [and their two daughters, Elizabeth and Margaret]. . . . If the name of Stafford Cripps became a byword for the royal family, it was more because they were put out that their vegetarian guests consumed a whole week's egg ration than because they feared for the throne. . . .
[In the house of commons]. . . Cripps . . . claimed that there was as little place in wartime for 'pleasure as usual' as there was for 'business as usual' and invoked the sanction of the majority opinion to curb abuses by 'small or selfish' groups bent on personal extravagance. . . The comfortable myth is that the British people put up with wartime privations cheerfully, even when they grumbled. Historians have demonstrated that this is too simple and that different views at different times were taken by different groups in the population. Thus attitudes towards food rationing at this time showed that among the professional and managerial classes there was an approval rating of 68 per cent (with only 7 per cent dissatisfied), whereas among workers in heavy industry barely 40 per cent approved - and 30 per cent were dissatisfied, mainly because manual workers felt their diet inadequate. Moreover, what working-class men missed most was meat. . . . It is not really surprising that a vegetarian toff preaching austerity should have found a better reception almost anywhere than in the heartland of the Labour movement. . . .
Nobody accused him of hypocrisy. 'He is a man of great personal austerity, a vegetarian, a teetotaller and a devout practising Christian,' Orwell assured Indian radio listeners. On 10 November Churchill proclaimed his own unrepentant and provocative statement of war aims: 'I have not become the King's First Minister in order to preside over the liquidation of the British Empire.' It immediately became a widely quoted remark, not least in India. Cripps's period as Minister of Aircraft production, from 22 November 1942 until 23 May 1945, when the wartime Coalition [Government] ended, saw the realization of his talents as an executive minister. . . . With Labour's landslide victory, once the votes had been counted at the end of July 1945, Cripps was immediately seen as one of the half-dozen most prominent members of the new cabinet.
. . . Cripps happily repeated these assurances on arrival in Delhi: "We want to give independence to India as quickly and as smoothly as we can." Gandhi arrived in Delhi . . . took up residence in the Harijan sweepers' quarter, where a camp had been set up. . . 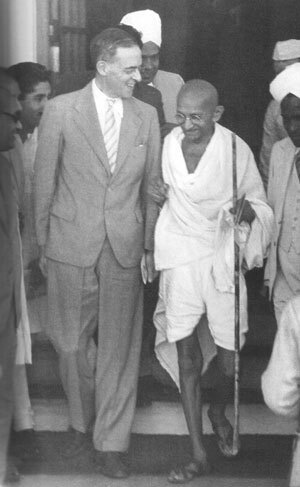 Here Cripps had his initial informal meeting with Gandhi on 31 March, first joining over 3,000 people for prayers before retreating, shoeless, to the hut for forty minutes of private talk.
. . . Cripps wrote in his diary: 'We can't leave this country without a settlement of some kind. If we did there would be bloodshed and chaos within a few weeks.' . . . He spared himself no effort. On 17 April he spent a long evening with Jinnah, not getting home until nearly one o'clock, only to rise at 5.45 a.m. for a meeting at Gandhi's camp in the sweepers' colony. . . . [The talks eventually broke down on 12 May at Simla, with no clear progress, particularly between the Hindu and Muslim positions ] . . . on the eve of departure, Cripps took his chance to get out again . . . 'I walked back up the hill very slowly like an old, old man,' he told Isobel. [further negotiations in Delhi also failed to find a final solution and Cripps returned to London in mid-June, then spent a month in the raw-food Bircher-Benner clinic in Zurich] . . . If the Delegation did nothing else, it served to demonstrate that Britain intended to quit India and that the transfer of power was no longer question of whether but of when and how and to whom.
. . . Even after the date for this transition had been advanced to 15 August 1947, Nehru found it hard to take in the fact that he would then be Prime Minister of an India that the British had finally quit. This consumation, so long awaited and so often heralded, in the end came quickly, little more than thirteen months after Cripps left Delhi for the last time. It was what he wanted and, to a greater extent than has generally been recognized, it was a result of his efforts. Stafford Cripps never fulfilled his ambition to visit a free India. Soon after his death, Isobel received an invitation to stay with Jawaharlal Nehru and made his generous hospitality the core of her own four month journey to Pakistan, India and Ceylon in 1952-3. Received with courtesy and respect as Stafford's widow by an impressively wide range of his old friends, now often installed in high office themselves, she had little reason to suspect that, half a century later, the name of Cripps would no longer retain its axiomatic link with the story of Indian independence. Cripps is best remembered for his efforts to rebuild the British economy after the Second World War . . . Combining the posts of Chancellor of the Exchequer and Minister of Economic Affairs, Cripps occupied a position of unique dominance over virtually all aspects of British economic policy.
. . . [on the subject of rationing] The new chairman of the Conservative Party, Lord Woolton, who had himself been responsible for food rationing during the war, set the tone early. Sir Stafford Cripps believes in austerity. he practises it himself almost as though it was a religious cult. That might be very good for him, but it is of no use to us. He knows nothing about the ordinary fun of life which you and I want, and I shudder for the condition of England when Sir Stafford comes back after spending three months with Gandhi. He is a bit of a saint, but we are not apostles of austerity. If Britain is going to prosper the people must have more food, more clothes, more to spend their money on.
. . . [this tone was picked up by other political opponents and the press, Cripps was an easy target.] Yet, within a matter of months, Cripps's career blossomed as never before . . . it was precisely his readiness to confront a stark situation with a stark response that distinguished him.